(1) the UK will also exit the European Economic Area (EEA) – this involves Article 127 of the EEA Agreement – a White Paper is expected on this. This is in addition to exiting the EU and Euratom. (2) the European Parliament issued a draft Motion for a Resolution on the negotiations with the United Kingdom – this document is here. (3) the European Council issued draft Guidelines for the negotiations, these were issued to 27 Member States and will be finalised at the EU27 meeting on 29th April – these Guidelines are here (curtesy of the Irish state broadcaster RTE). On foot of these further developments, Email Alerts to subscribers to Cardinal Environment Limited EHS Legislation Registers and Law Checklists will be sent on Monday. 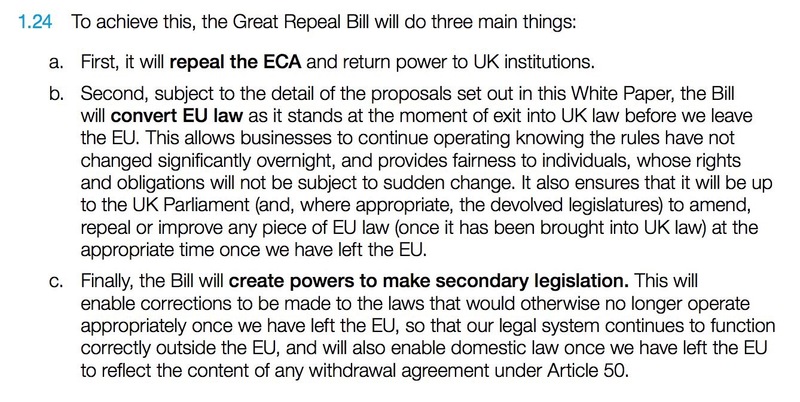 The UK Department for Exiting the EU (DExEU) has today published its Great Repeal Bill White Paper “Legislating for the United Kingdom’s withdrawal from the European Union”. Email Alerts will be sent tomorrow to Subscribers to Cardinal Environment EHS Legislation Registers and Law Checklists.